Do You Know What 5 Phrases to Avoid After a Car Accident? The moments that follow a car accident can be scary and confusing. Your emotions are likely running high and so is your adrenaline. During the first few minutes and hours after a car accident, the things you say can and WILL be used against you. If you are not careful, you could say things that could adversely affect your ability to file a claim and collect compensation. It is important to know ahead of time what 5 phrases to avoid after a car accident in Colorado Springs. It is easy to feel sorry for the other drivers – even if the accident was not your fault. 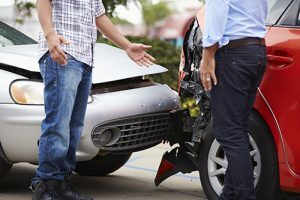 Their car might be totaled, they may even be injured – and you may be tempted to say “I’m sorry” as a way of comforting them. DON’T! A simple “I’m sorry” can be used to show that you admitted guilt and responsibility for the accident. Even if you mean “I’m sorry you’re late for work” or “I’m sorry you are hurt” – try to avoid using the words “I’m sorry”. When eye witnesses and bystanders hear you use that phrase, they may believe that you are the one who caused the accident. If your accident is minor, you may be tempted to avoid calling the police and reporting it to your insurance company. The other driver may even be pressuring you to do this. DON’T! Every accident, no matter how minor, should be reported to the Colorado Springs police and your insurance company. If you don’t – then it is just your word versus their word and collecting compensation for damages is considerably more difficult. Even if you believe that you are uninjured, it is best to be seen by a qualified medical professional. Your doctor will be able to examine you thoroughly for any injuries you may have suffered. Often times after an accident, adrenaline masks the symptoms of injuries. As such, most individuals believe that they are uninjured after an accident but discover after a day or two that they are truly injured. Always seek medical attention after an accident. It is always best to avoid saying things on social media about your accident. What you believe is a small detail may actually jeopardize your chances of filing a claim. Never post photos of your injuries or of the damage to your vehicle. Even a simple picture of you at a party the night of your accident could be used to show that you are not as injured as you claim to be. Avoid social media before talking to your attorney. When the at-fault driver’s insurance adjuster calls, avoid agreeing to any recorded statements and NEVER sign any settlement without first speaking to an experienced attorney. These statements will be used to reduce your claim and the settlement they usually offer initially is only a fraction of what you will likely need to recover. After an accident, the things you say are important. As such, you should always avoid saying those 5 phrases. When in doubt, say very little before talking to an experienced lawyer. Your lawyer will be able to direct you and protect you during this difficult time. Remember: insurance companies are very reluctant to pay injured accident victims. As such, they will look for any holes in your case to reduce your compensation. Don’t let something you say give them the ammunition they need to reduce your claim. An experienced attorney knows how to fight the large insurance companies and WIN. Your car accident attorney will be able to negotiate with insurance companies on your behalf while you are focusing your energy on your recovery. A car accident can completely derail your entire life and cause unnecessary pain and hardship. If you or someone you love has been injured in an accident that was caused by another person’s negligence, our attorneys can help. At the Rector Law Firm, our Colorado Springs car accident attorneys have the experience and the resources to build a case that is designed to obtain maximum compensation for our clients. Call us today at 719-578-1106 for a free initial consultation and review of your case.